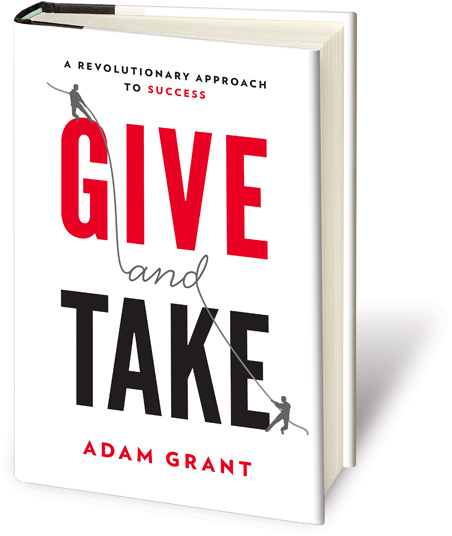 According to Adam Grant in this book, there are roughly 3 types of people based on their reciprocity styles, which are takers, matchers, and givers. Takers tend to take more than they give to others, matchers will try to balance what they take and give, while, obviously, givers try to give more than they take. In a preliminary question, Adam asked several people, who are from those 3 types will be at the bottom and top of success ladder. Intuitively, the answer for the bottom will be the givers (since they always give more right?) and the top will be the takers or matchers. Well, the research showed that it’s only half true. Both of the bottom and top is dominated by givers! To be more obvious, Adam said that there is 2 types of givers. Selfless givers and otherish givers. Selfless givers are those people who place the interest of others more important than their own interest, and majority of them end up being ‘doormat’ of the others, especially if takers know how to exploit their altruism. In the other hand, otherish givers are those who will also put the others’ interest in important place, but put their own interest as well. In the long run, otherish givers will have more energy than selfless givers because they can avoid mental burnout (Chap 6) and continue (or even more) contributing positive things to others. This book will also explain the differences between those 3 types of people, such as how they build their network (Chap 2), how they taking and giving credit (Chap 3), how they recognize hidden potential behind a person (Chap 4). Adam also explained that most of givers tend to use ‘powerless’ communication, a communication style that is believed to be able to make people more empathy. Each chapters are filled with excellent examples of how givers, which looks like they have been sucked in the beginning, tend to get more success in the long run, and their succeed create more opportunities for them to giving more. Adam Rifkin, a person that is labelled with ‘the most networking man in the world’, has proved this. He gladly helped people in his expertise (IT industry), give many people their needed advice, connect them to people who possibly can help them further. Rifkin never asked something specific for return. But, he always tell to people that he helped, they can do him a favor by helping others. This is the effective way of spreading the ‘giving’ paradigm. But, please do take notice with fakers, takers who tend to act like giver, but they hide hidden agenda behind their generosity. Adam gave an example of Ken Lay, former president of Enron. He once famous because of his generosity in many charity events. But, in the end, it showed up that he did that because he wanted to get better connection to ‘big players’ in his industry and government people. In fact, Ken Lay is a true takers. He tried to take advantage from others for his own interest. In the end, we have to think that givers (esp. otherish one) never feel his share/portion (of anything. success, profit) will be smaller just because they help other people. Instead, they tend to make the ‘pie’ larger so that it’s enough to be shared to more people. They help others while in the same time it’s encourage their own interest. In the end, it will help to make this world a better place, isn’t it? After all, we are social creatures. We help ourselves by help others. From my personal view, what Adam Grant said is in congruence with my mindset. I pretend myself to be half giver and half matcher. As I am working providing services (customized software development), I will primarily think my client needs first. If they need a customized software one, it means that the generic product in the market doesn’t satisfy them. Also, I will try as much as I can to help them. But, of course, in the other hand, I have my own standards, e.g in fee/pricing. I will give the fair price, which is fair to my clients and fair to myself too. I am not the person who will decrease my fee to the bottom just because I desperately want to take a project (‘doormat’ mentality?). In fact, it will possibly hurt my credibility and image (correlated with cheap product). And worse, maybe I will not feel to be much responsible if I think I am not fairly paid for my effort. So, at first, I will maximize my offered value to clients, and then ask fair price for my efforts 🙂 Seemed like win-win solution. Now, which reciprocity style is dominant for you? Do you want to try to become givers (if you’re not currently)?. Take some assessment of your reciprocity styles in Adam Grant’s website here.